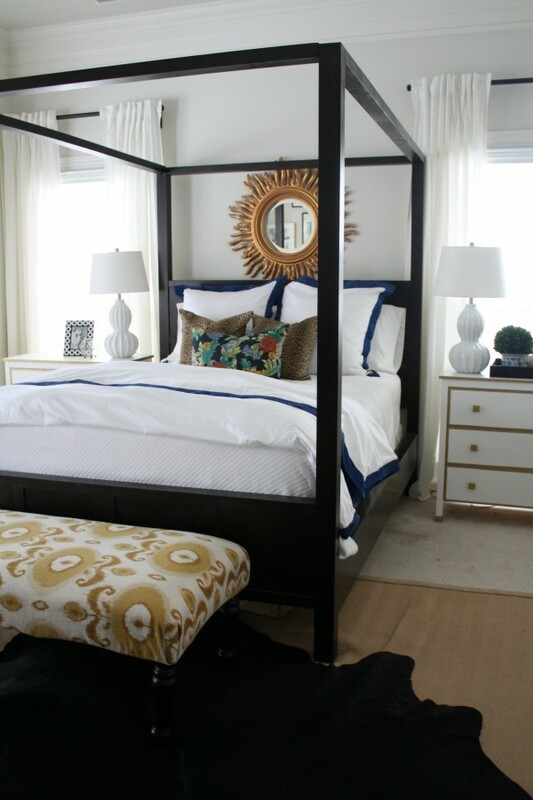 Want the designer look in your bedroom? Marissa Waddell shares some of her key considerations for styling a bed and developing a striking pillow story in the bedroom. How was your weekend? We were bombarded with rain, so all outside projects were put on hold until it dries up a bit. However, it did allow me to focus on organizing my office for a while and I’m getting close to having it just the way I want it. Those of you who have been asking about my office closet makeover, I promise you will see the after photos soon. Between our basement renovation, the Outdoor Extravaganza and wrapping up client projects before summer holidays, that particular project took a back seat. I’m sure some of you can relate! 1. How big is the bed? King-size beds usually require arrangements with two or three big Euro pillows. Queen-size beds can handle standard or Euro arrangements. Most of these arrangements work for twin-size beds, too– just half the number of pillows (round down for odd numbers). 2. Is there a headboard? The height and visual weight of the headboard have a big influence on which arrangement is most appropriate. Typically, the bigger the headboard, the bigger the pillow arrangement. As much as someone might love layers upon layers of pillows, it’s sort of a waste if they’re not going to spend the time to make that kind of bed every morning. For busy people–parents with small children, especially– I usually suggest a simple arrangement with a showstopping print. Thank you, Marissa! 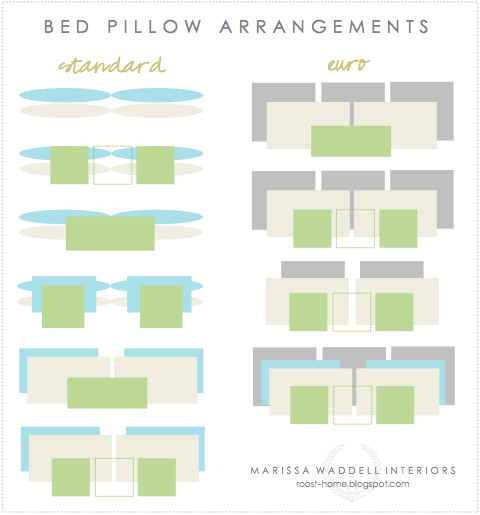 Your cheat sheet for styling a bed is super handy and I love that you consider both form and function in your pillow selection process. So, do you keep it simple and paired down or do you like a bed full of pillows? I’d love to know. Love this cheat sheet. I bought some Euro pillows and shams for my bed, but it still looked like it needed something else to finish it off. I’m going to add one of those long pillows in the front after seeing the photos. I’m #1 on the Euro side. I’m liking the standard side to though. Might need to change things up a little bit. Thanks for sharing. Love my pillows on the bed! I’m one of ‘those’ gals ;-) And I do take the time every day to place them on the bed nicely… but I have to say, there are ‘those’ day that make me wonder what it would be like to slip on over to the simpler side of pillows-on-the-bed life! Thanks for sharing Marissa’s cheat sheet with us! I have those days too. We have quite a few pillows and I like how inviting they make the bed look, but they can be a pain too! After 15 years of arranging pillows on beds & shams, shams, shams, in our B&B, I’m at a point where I think I want to remove the shams, possibly even go with a variation on your #1 standard arrangement. Am I shooting myself in the foot? Are shams absolutely necessary, or should I simply add a few pillows?I like multiple pillows on the beds, we use 4 sleeping pillows on each bed along with a couple more on some, not so many on others. Your comments are really appreciated!